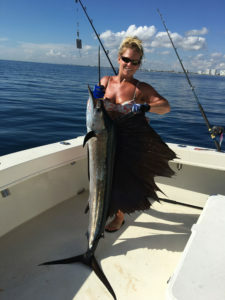 Goddess Charters offers several options for your South Florida Deep Sea Fishing Charter. Get ready to catch fish on board Grims Revenge, our passionate fishing team is ready to ensure you catch fish and have fun. Captain Cory and his skilled team invites you to experience a unique deep sea fishing adventure with us. 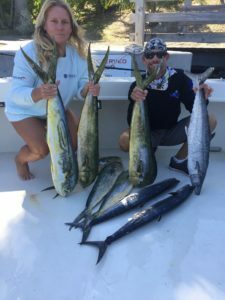 We have a completely equipped charter boat for off shore fishing and a crew with the necessary expertise and knowledge to give you the best possible deep sea fishing trip. Trolling: The more common method of catching fish, enables us to cover ground while looking for the targeted fish species including Wahoo, Sailfish, Mahi Mahi, Tuna, Barracuda and Kingfish. Trolling with planers and top baits is very effective. Baits range from ballyhoo, mullet, bonita strips and squid. Lures and artificial baits are also a part of the spread. The reef produces most of this action but going out to the Gulf Stream is not uncommon either. The use of medium tackle is recommended in case the fish of a life time happens to get hooked. Live Bait: Slow trolling or kite fishing are common techniques used. Slow trolling allows you to cover more ground, while kite fishing is more stationary, depending on sea and wind conditions. Both are very effective. The use of light to medium tackle is recommended. When fish are traveling deep, slow trolling is the way to go but if the fish are feeding higher up in the water column then the kites come out. This method is a lot of fun because it’s more visual. The fishing season for these fish species varies, which enables us to offer you fishing for different types throughout the year. 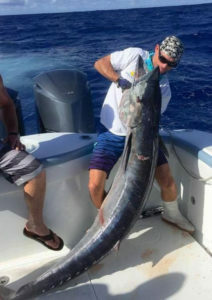 We will take you fishing off shore the cost of Boca Raton and Deerfield Beach Florida on our five-hour charter trip. . We also have Bahamas and Island Charter trips where any of these fish can be found and caught. Goddess Charters – We Catch Fish! If you dream of catching a real prize fish, then our charter is the best choice for deep sea fishing. Our team includes professionals with 20+ years of experience in trolling, slow trolling and kite fishing. Members of our team have experience in fishing competitions, so with their help and instructions you can be sure that you will fish at the best locations and with the top equipment. You will definitely learn many techniques and tips for a successful deep sea fishing charter trip. Our Fishing Team is committed to give our customers the best opportunity to catch fish and have fun. The areas we serve include cities and towns throughout Broward County and Palm Beach County including Boca Raton, Deerfield Beach and Pompano Beach.